A recent Public Agenda poll again highlighted a long-held perception amongst Americans that the US does “more than its share” internationally. On average, America taxpayers are of the opinion that 24% of the federal budget goes toward foreign aid. In actuality, less than 1% does. Since the end of the Cold War, governments from post-industrialized countries — the primary donors for international development and relief — have significantly decreased their contributions. Between 1992 and 1997, official assistance from leading industrialized countries dropped 30 percent, while at the same time their GNPs jumped almost 30 %. In 1970, the world’s rich countries agreed to give 0.7% of their gross national income as official international development aid. Most rich countries have failed to reach this reasonable goal, but five countries have exceeded the target: Denmark, Luxembourg, the Netherlands, Norway and Sweden. 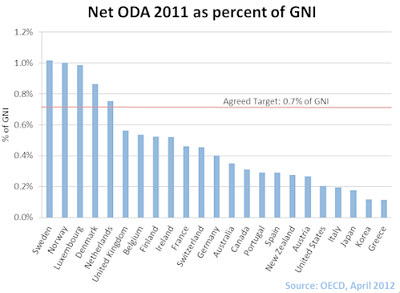 When you look at countries’ foreign aid relative to the size of their economies, the United States is devoting 0.2 per cent of its gross national product (GNP) to help the world’s poorest countries, much less than most other industrialized nations. American NGOs gave $6.6 billion in grants, goods and volunteers. Religious overseas ministries contributed $3.4 billion, including health care, literacy training, relief and development. It is especially noteworthy what religious overseas ministries and NGOs, that is generally smaller nonprofit organizations, are doing in the field of international relief and development. Certainly an argument could be made that these are the organizations that deserve our support, and via whom we’ll get the best bang for our buck.